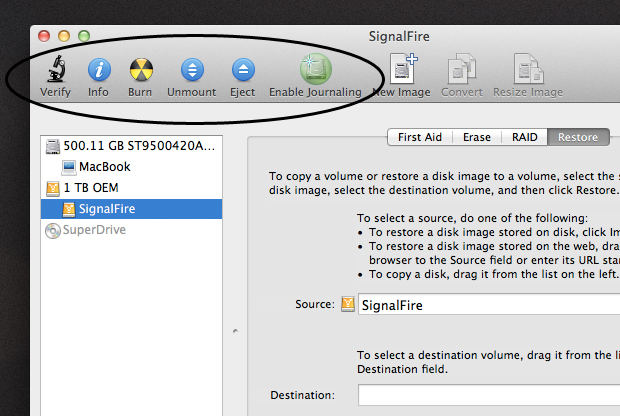 Using Disk Utility is a good way of recovering your files from a dodgy Mac hard drive. As basic types of data recovery go, Disk Utility is OK, but anything more complex and you’ll need a data recovery company. These posts are courtesy of such a company, thank you Recover Deleted Data. I have an old 500GB WD Mybook, one that still has to connect to an external power supply and is connected to USB via Firewire. The hard drive is never moved and has been working as expected in the last few years. Recently, after not being used for about a year, it powers on but the connection via laptop(s) does not pick up the external drive. I purchased another Firewire cable but no luck here. There is no sound coming out from the drive which is unexpected. I believe it is a simple case of the connection between the SATA drive being loose/broken and I just need this drive connected to another external USB drive, and the data transferred. There will be no need to fix the WD 500GB drive and happy for you to keep and re-sell it if you like. The hard drive will not turn on any more. The model is a Western Digital MyBook (Essential Edition 1TB USB 2.0) External Hard Drive. I’ve had Iomega 500gb external hard drive for about 4 years and just recently when I connected it back on all I hear is some clicking sound. I have tried doing the basic by opening and resetting the reader back in its position however to me it sounds more like the drive to me. I need to recover the deleted photos and the videos of my kids which is more precious to me and my partner. The hard drive beeps when first powered on. The driver will not be recognised by the computer. The make of the external drive is WD and the files are deleted. Received file disk error upon restart after downloading OS X High Sierra on MacBook Pro 2012 model. Apple store suggested a damaged disk and advised a reformat. Note: With all the above examples, you may first like to attempt running Disk Utility before contacting a data recovery service to recover your data.